I'm just a kid who's 4. Each day I grow some more! I like exploring, I'm Caillou! So many projects to make! Each day is something new! I will share them with you! 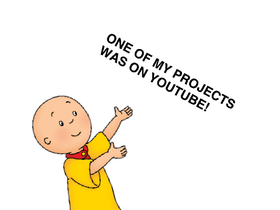 I'm Caillou! One of my projects was on YouTube! I OWN NOTHING WITH A MILLIONS PROJECTS!